Paul G. Harris (ed. 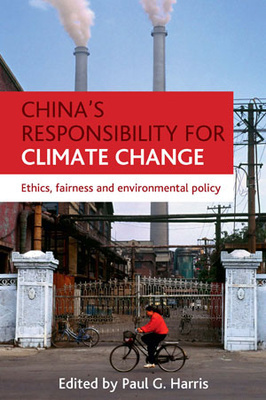 ), China’s Responsibility for Climate Change: Ethics, Fairness and Environmental Policy (Bristol University Press/Policy Press, 2011). China is the largest national source of the greenhouse gas pollution causing global warming and resulting changes to Earth’s climate. Therefore, on a very practical level, China is absolutely central to the world’s efforts to address climate change. That said, it is a more complex and controversial question to ask whether, and to what degree, China is responsible for climate change. Certainly the question needs to be asked because the answer to it will be central to China’s willingness, and indeed the willingness of the Chinese people, to be fully involved in global solutions to this problem. However, the question of China’s responsibility for climate change is seldom posed, making this book possibly the first one devoted to it. Drawing on practices and theories of environmental justice, China’s Responsibility for Climate Change describes China’s contribution to global warming and analyzes its policy responses. Contributors critically examine China’s practical and ethical responsibility from a variety of perspectives. They explore policies that could mitigate China’s environmental impact while promoting its own interests and meeting the international community’s expectations. The book is accessible to a wide readership, including academics, policymakers and activists.